True Hope and a Future: ARE YOU WATCHING? 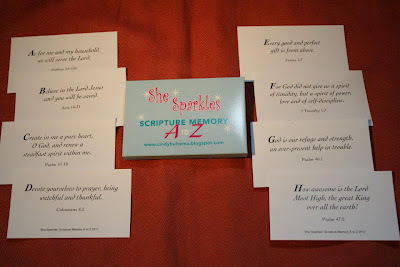 If you've joined me in linking up with She Sparkles for the Scripture Memory Challenge this year, you'll recognize this verse as the one we've been learning for the past two weeks. Keep reading to learn about my first-ever giveaway! One of the many benefits of memorizing Scripture is that it slows you down. It's amazing the things that God can bring to your attention once you stop to really ponder what He's saying. I did a quick search of the word "pray" at BibleGateway and it showed up in 367 verses. Obviously God has a lot to say about prayer! Pray to God anywhere, anytime about anything! So often we pray and leave it at that, but when we do so we often miss the best part - God's answers! I find it helpful to keep a record of my prayers AND God's answers to them. Ask God for eyes to see Him working and recognize the answers to your prayers. There's nothing more exciting than watching God at work! Scripture is full of commands to be thankful. Think about it...if you do something for someone else, don't you appreciate a "thank you"? We're created in God's image, so who do you think we inherited that trait from? I believe these directions are in this order for a reason. Isn't this how prayer works? So often we pray and leave it at that, but this verse illustrates how we complete the process. First we pray, then we watch for the answer and when it comes we give thanks! I have a perfect example of this process from this past weekend. I have been praying for God's provision for the children who attend our school in Kenya because of their great need for food and water due to the drought there. I attended the Women's Leadership Conference at Cornerstone University last weekend. I spoke with my friend Cindy before the conference started Friday night and gave her an update on our school. She then related a story of God's provision experienced by Francis Chan. After the conference, a group of us went to Starbucks. I again talked about our school and the need there. Kim - who had earlier shared about her soon-to-be-published book - mentioned that the proceeds from her book will be donated to a ministry that feeds orphans! Cindy came up to me afterwards and said, "This is just like the meat in Francis Chan's story!" God brought me to the right place at the right time with the right people and made a connection that I would not have had otherwise. How cool is that! Yet, if I hadn't been watching, or if I hadn't shared with Cindy who was also watching, I may have missed the connection between my prayer and God's answer. Lord, you are absolutely amazing! I know I miss a lot, but thank you so much for allowing me to see this time. Help me to continue to recognize you at work and give You the praise and glory. So, how are you doing with the Scripture memorization challenge? I'd love to hear from you. If you haven't joined us yet, it's never too late to start! 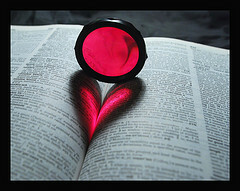 Memorizing Scripture has had a HUGE impact on my life and God makes it possible for everyone - even me! You know what that means...even you! Cindy at *She Sparkles* has donated one A-Z Versepack and Versebook for me to give away, each to a different winner! Why would you like to win this giveaway? Starts today, Friday, February 24, 2012 and ends Wednesday, February 29, 2012 at 9:00 p.m. EST. Winner will be contacted via email no later than March 3, 2012. Be sure to let me know about your extra entries along with your comment! If your email address is not connected to your ID please leave your email address with your comment or email it to me at caughtinhisnet@yahoo.com with the subject "Giveaway". 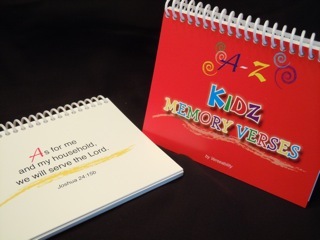 A custom A-Z Versepack (made by Verseability) contains all 26 of the verses for the year. The Versepacks are business card sized and perfect for carrying in your purse or pocket. If you don't win the giveaway, the packs are available for purchase at the special price of $ 5.00, plus shipping. Versebooks are also available for purchase for the price of $8.00. You can order them by e-mailing: darlenedykstra@yahoo.com. Be sure to mention *She Sparkles* to get the special rate. Lisa, I get goosebumps again when I think of our "connecting the dots" moment at Starbucks. Only God! What an awesome privilege to be His kids and watch Him work in such powerful, life-changing ways. Why am I so surprised when He answers our prayers? Oh Lord, increase my faith!! I love your devotion and insights into Colossians 4:2. Thanks for sharing your gifts with us!!! Love that you are connecting the A-Z memory to your blog...I'm trying to learn them too...I sometimes focus on memorizing them when I am cleaning or treadmilling...And, maybe if I'd slow down, I'd hear some answers too! I think I'm good at praying and thanking, I'm not so good at listening. Oh, and why would I want to win your first ever giveaway??!! Hmmm...so I could pass them along to someone whose name I've HEARD God whisper to me! I would like to win the verse pack because if I don't win one, I may never own one. You see, the plan was to make one, adding to it each time a new verse was given. Well, I have not begun to get that together. So I guess, it would be best to win one already put together. Thanks Lisa for the insight. I'll be waiting to hear from you.